I guess the world having accepted penguins unto its bosom (MARCH OF THE PENGUINS, 2005, MADAGASCAR, 2005, HAPPY FEET, 2006 – to say nothing of BATMAN RETURNS, 1992, or those CROCODILE HUNTER episodes; and then there are those giant fossil penguins in Peru), it was high time to extemporize on the species – by making them SURF. Uh, okaaay…. 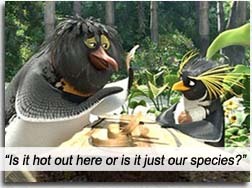 SURF’S UP – a 3D cartoon directed by Ash Brannon (TOY STORY 2, 1999) and Chris Buck (Disney’s TARZAN, 1999) – throws penguins to the boards in a documentary-meets-reality-show brouhaha. And succeeds for its brash surefootedness. Following young surfer penguin, Cody Maverick (voiced by Shia LaBeouf), from his thankless job sorting fish on an Antarctic ice floe to the Big Z Memorial Surfing Tournament in the tropics, the film is a Christopher Guest-ish formula of intrusive steadicams, interviews, intricately-overlapping dialogue and archive footage (stunning for its yellowed authenticity and scratched plates). Misunderstood by his fretting mother (Dana Belben) and poo-poohed by his big fat slacker brother (Brian Posehn), Cody makes it to the qualifying rounds of the tournament, but is washed out by 9-time winner, Tank (Diedrich Bader), a maniacally-egotistical brick wall of a penguin. Mario Cantone, doing his best Scorcese, is a talent scout (a plover, I think) who rides a whale around the world recruiting boarders. His promoter boss is a frenetic beaver with a Don King hairdo called Reggie Belafonte (James Woods), a Groucho-like wise-cracker whose non-sequiturs are an absolute riot, at one point telling us to look at the plover’s fast-moving feet “going ticka-ticka-ticka.” There are three baby penguins giving interviews, so cute that someone needs to be slapped; while another baby penguin, Arnold, constantly pretends to drown just to be rescued by Lani (Zooey Deschanel), a female penguin lifeguard whom Cody falls for. I was laughing out loud; kids around me in the cinema were not – I didn’t care. It was a pleasure to watch a film supposedly aimed so low, yet crafted so high; a corollary pleasure not having to contend with uneducated kids of uneducated parents, mindlessly guffawing over pants falling down and fart jokes. The Surfaris’ Wipeout under the end credits meant nothing to these iPod boomers; neither did they realize that the penguin cannibals capturing fowls for their pot never actually cook and eat anyone (the MPAA would have an aneurysm), making them pretty ineffectual cannibals. Jon Heder once again proves his limitless range by playing a stoner surfer rooster – oh, BIG surprise! – a one-trick-pony chicken. Could we, as a nation, just hire someone from the mafioso to whack that unnecessary actor? I’m sure someone from THE SOPRANOS could use the work. Banished to the jungle, Cody discovers Big Z in hiding (voiced by Jeff Bridges, channeling his Dude from THE BIG LEBOWSKI), fat on a diet of clams and sunshine, having left pro surfing behind for lack of joy, his main goal to abide in solitude after his crushing defeat by Tank a decade ago. And the movie’s “message” comes across loud and unclear; entreating the youthful, adventuresome spirit in all of us, it ends up informing the lackadaisical swine in most of us – when Z teaches that winning isn’t everything; it’s about having fun. Animation performances are masterful, as are the blitzkrieg vocalizations, not to mention some of the best surf scenes this side of BIG WEDNESDAY. I thought I could see the end coming: in the final surf-off, Cody nobly loses his advantage by preventing Tank from Kentucky Frying the chicken; in the process he is thrown off his board by a massive wave which crashes him headlong into Big Z’s legendary surfboard, attached to a rock outcrop like a gravestone. Visions of Cody riding Z’s board in for a victory accompanied by the Inspiring Music Swell did not materialize. As he goes under, the board is splintered and the chicken wins, while Tank is humiliated by being lifeguard-saved, then tries to steal the trophy because the chicken is so oblivious he doesn’t know he’s won. Yes, on paper it sounds funnier, but on film it is anti-climactic. But then we applaud the writers for practicing what they’d preached! (Lisa Addario, Christian Darren, Don Rhymer and Joe Syracuse.) In every movie lauding “fun” over “winning,” the underdog usually wins anyway, because Market Research won’t support Losers. But this film gives Market Research the middle fin. And the Big Zebowski looks on in contentment as a new generation of shiftless penguin surfers aspire to nothing more than tagging the ultimate tube. Director: Ash Brannon, Chris Buck. Writers: Lisa Addario, Christian Darren, Don Rhymer and Joe Syracuse. Starring: Shia LaBeouf, Jeff Bridges, Zooey Deschanel, Jon Heder, James Woods, Diedrich Bader, Mario Cantone, Kelly Slater, Rob Machado, Sal Masekela, Ash Brannon, Chris Buck, Brian Posehn, Dana Belben, Reed Buck.